> Roots & Flowers: I Heart Grocery Gardening! herbal articles,recipes and tips on growing and using herbs. I first heard of this gorgeous book from Teresa O'Connor, one of the book's authors, and one of my fav Twitter follows: @seasonalwisdom. If you're like me, you will love this book for the photos alone. As a very visual person I appreciate the colorful pictures of mouth~watering fruits, vegetables and herbs on every page. And some of the pictures of the recipes are downright indecent! Example: page 140 has a recipe for Mascarpone Crostata with Strawberries & Apples topped with mint! This is truly a book for all seasons. It's got gardening tips for starting, growing and harvesting a huge variety of edible goodness, but it also tells you how to preserve what you grow - or how to select what you eat from the market if you aren't growing. However, it's the recipes that have earned this book a place on my kitchen shelf. They are inventive and healthy and incororate herbs into cooking in very innovative ways. Today I am making the braided Rosemary Bread from page 80. You should smell my house!My family is walking around salivating as it bakes. 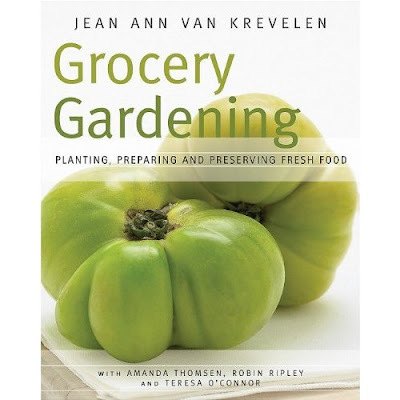 Grocery Gardening combines wit, wisdom and well-researched information for planning and planting your food garden. This beautiful book includes more than 25 fruit, vegetable and herb recommendations, with garden planning, planting, and harvesting information, and healthy recipes as well. Grocery Gardening encourages gardeners and non-gardener's alike to plan meals based on what is in season. Whether you buy local or grow your own, the Grocery Gardening recipes will delight your family with its seasonal freshness. Also included is a chapter on preserving your harvest, with tips for freezing, drying, canning and preserving. In addition to tips on knowing when to pick your home grown vegetables, the authors offer advice on how to select the freshest produce at your local market and select complementary ingredients to combine with your home-grown edibles. I heart Grocery Gardening and I think you will too! This book sounds fabulous, thanks for sharing! Looks like a lovely book! Yay, this is great I can comment!!!! I want this book. I'm going to order one. It sounds like th ekind of thing I would use often. If books don't include pictures w/ the recipes I tend not to use them. This one sounds great though. DD, yes, I think you would love this book. The pictures are great, and I think you'd appreciate the inventive ways they incorporate herbs into the recipes. I have ALOT of recipe books and am not easily impressed. This book is useful *and* beautiful. What a nice review! Thanks a bunch. As Jean Ann said above, it was awfully fun working on this writing project with such a great team. Meanwhile, I really enjoy your tweets as well. It's obvious you gals had a good time writing the book. It shows! I'm just loving it. Use of this blog is for educational purposes only.